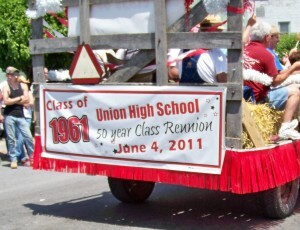 Union High School Class of 1961, used the opportunity presented by the Farmer’s Day weekend on June 4, 2011 to celebrate their 50th High School Class Reunion. 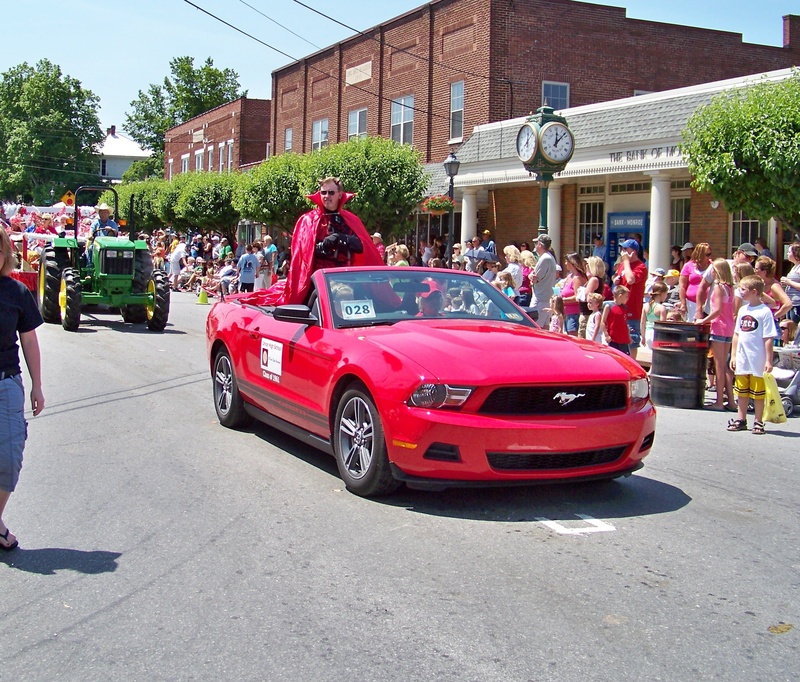 Class members created a float for the parade, which was led by a red Ford Mustang convertible owned and driven by Paulette Sizemore carrying the official mascot of the former Union High School. 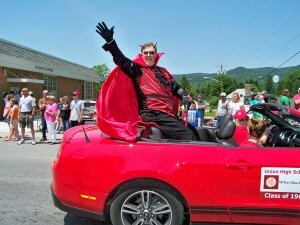 Sonny Bell was in full costume portraying the UHS RED DEVIL. 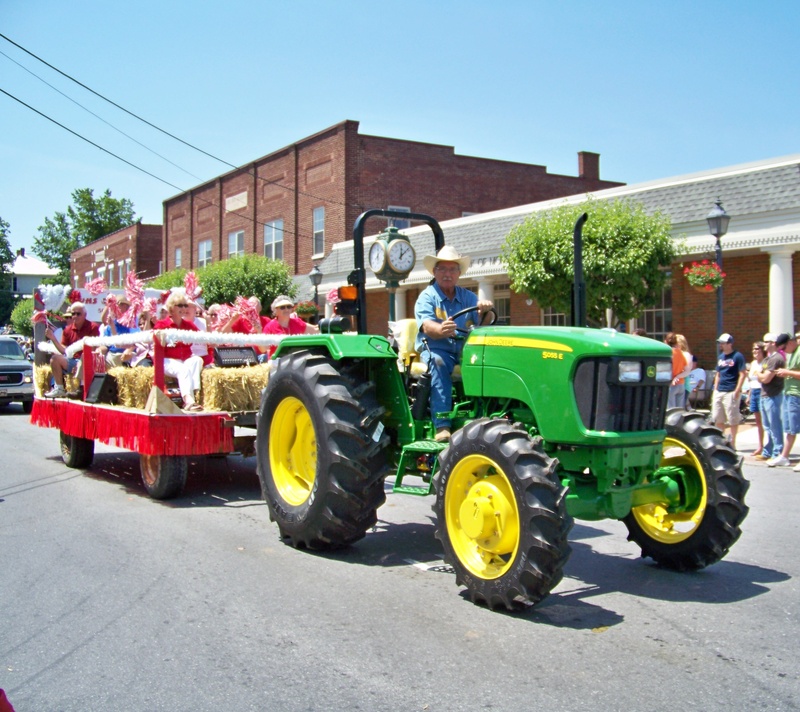 Following his stunning presence were classmates riding on a hay wagon pulled by a new John Deere Tractor driven by David Sizemore. The tractor was loaned to the class by Brian Humphries from Harvest Equipment Company in Lewisburg. The hay wagon was provided by Brian Wickline (Monroe County Agriculture Agent) and his family. The Wickline farm was also used as the site to decorate the float. Hay bales used for seating on the wagon was provided compliments of the Mountaineer Farm Supply in Union. 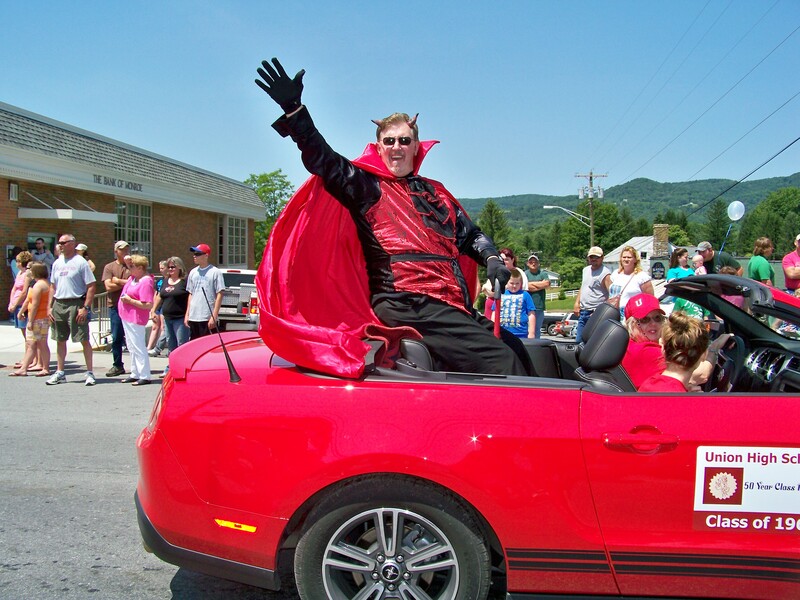 Disaster nearly struck when the participants noticed the wagon had a flat tire as they were lining up for the parade. 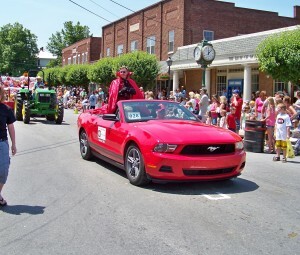 Sheriff Mike Gravely, Union Fire Chief Larry Dunbar, Fireman Adam Jamerson and a helper all saved the day by repairing the flat tire just minutes before the parade started. 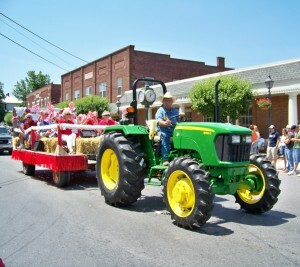 Much hard work was evident, not only among class members but also in regards to other floats and parade entries and all other events over the course of the Farmer’s Day weekend. The cheers and joy exuded by the participants as well as the hundreds who lined the sidewalks made for a joyful celebration of this significant piece of history for the Class of 1961. 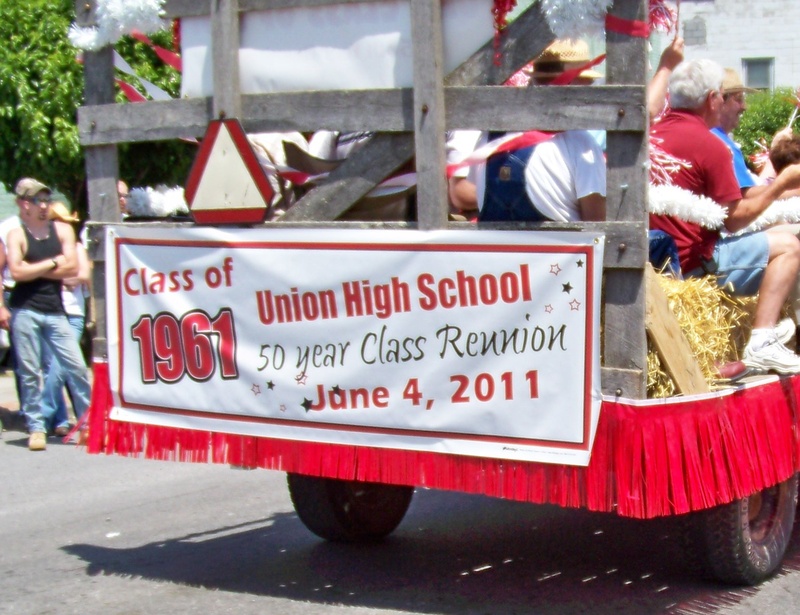 At 6:30 in the evening, the Union High School Class members gathered at the Elks Country Club in Lewisburg for dinner, to celebrate their 50th Class Reunion and to reminisce of their days at Union High School. Master of Ceremonies was Betty Sue Leach Moore. A memorial program was presented by Nancy Lynch Lightner for the deceased members of the class; Dorothy Dunbar, Barbara Beckner, William Beasley, Robert McClary, Roy Saylor, Larry Dransfield and Paul Hill. Entertainment for the evening was provided by Sonny Bell. 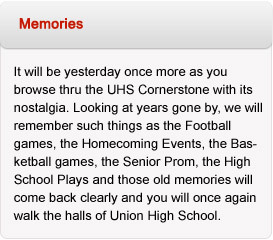 Thank you Union High School for our Memories! Click here to view the Most Recent Pictures of the Class of 1961. Planning the event; Betty Sue Leach Moore, Nancy Lynch Lightner, David Sizemore and Sonny Bell.